← Is the Scientific Method obsolete? Sean Carroll of Caltech is right. Well, partially right at least. In his lecture at Fermilab in 2013 (Particles, Fields and The Future of Physics) as reported in symmetry magazine that same year, (Everything is Made of Fields, July 18, 2013), he makes some important assertions. “To understand what is going on, you actually need to give up a little bit on the notion of particles,” Carroll said in the June lecture. Instead, think in terms of fields. You’re already familiar with some fields. When you hold two magnets close together, you can feel their attraction or repulsion before they even touch—an interaction between two magnetic fields. Likewise, you know that when you jump in the air, you’re going to come back down. That’s because you live in Earth’s gravitational field. Carroll’s stunner, at least to many non-scientists, is this: Every particle is actually a field. The universe is full of fields, and what we think of as particles are just excitations of those fields, like waves in an ocean. An electron, for example, is just an excitation of an electron field. This may seem counterintuitive, but seeing the world in terms of fields actually helps make sense of some otherwise confusing facts of particle physics. In his lecture Carroll explains this model very clearly in terms of quantum field theory, a major premise of which is that every charged particle carries with it a unique field and that the effects of these in motion and in collisions is the result of the interaction of those unique fields. The place where Carroll is right is in his explanation that what we, and most physicists call particles are, in fact, simply concentrations of the energy of those fields. So let that sink in a little. According to the standard model there exist in this world at least 60 different charged particles, count ’em. And each is carrying its own field around with it. That makes a pretty complicated picture, doesn’t it? And they are all out interacting with each other both inside and outside of their atoms and molecules. It makes the idea that we can understand their workings pretty impossible, it’s no wonder that quantum physicists gave up and decided that we can’t possibly measure them with any accuracy and invented a new form of probability theory to take the place of explanations. “There’s an analogy that’s often used here,” Carroll said, “that doing particle physics is like smashing two watches together and trying to figure out how watches work by watching all the pieces fall apart. What’s really happening in LHC collisions is that especially excited excitations of a field—the energetic protons—are vibrating together and transferring their energy to adjacent fields, forming new excitations that we see as new particles—such as Higgs bosons. Thinking in fields can also better explain how the Higgs works. Higgs bosons themselves do not give other particles mass by, say, sticking to them in clumps. Instead, the Higgs field interacts with other fields, giving them—and, by extension, their particles—mass. 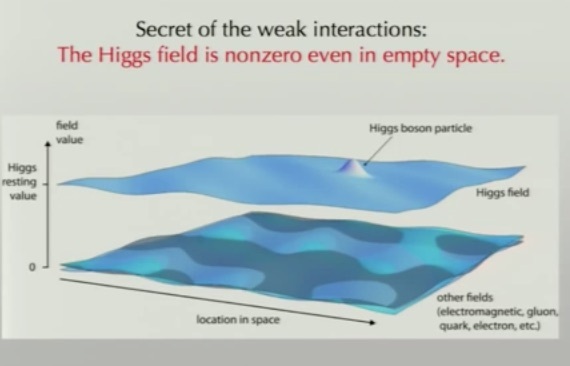 As shown in this image from his lecture, the Higgs field is on its own, hovering somewhere above the other multiple fields dancing below, a not very convincing image, and what is it made of? Waves are waves of something and so are fields. Mass equals energy, doesn’t it? So why don’t we just say that instead of introducing another term for energy that isn’t needed? We’ll never know. Back to where Dr. Carroll is less right. There is a simple way to cut through all of this complexity. Just as he has eliminated a complex variable by making particles into what they most likely really are, a version of Einstein’s notion that they might just be “condensations of the ether,” what if we eliminate all of those multitudinous fields and say there is only one? Then we could give up having to explain how each of over 60, and who knows how many more, unique fields arose (a chicken and egg quandary, as well, in the sense of which comes first, the field or the particle, and, by the way, from whence did either arise? ), we can see these multiple entities as simply arising from the energy of a single, primal field, giving us only one mysterious entity to seek the origins of. The obvious description of it is that it is an electromagnetic field, high frequency, high energy because there is so much of it, fixed in location, extending indefinitely in all directions, but internally turbulent. And because of its nature and structure it establishes a key limit, “c,” the velocity of light and all other EM radiation. No photons needed, light is simply a coherent distortion of the field itself, just as sound is just a distortion of its own medium. No particles were destroyed in this experiment, they just didn’t exist in the first place. The single omnidirectional EM field might also offer an alternative to the universe we perceive arising from a singularity and also the expansion of space (the field). Lots of holes in this, I’m sure. More thoughts on this after some sleep. I think that if we accept this model, there are more than a few “accepted” things we have to give up. Besides “particles” and a multiplicity of fields, we have to give up the idea that we can tell the age of “our” universe. If this model is correct, then throughout the cosmos, this extended field, these small bangs have been occurring forever, as new, nascent universes arise, clusters of them form in some places, voids exist in others, some mature and exist long enough for sentient life to arise and become conscious, and so on. But others don’t mature, or achieve stasis like the “flyers” in Conway’s “Game of Life,” just go on undeveloped. And some might dissolve back into the void, Lord Dunsany’s “unreverberent blackness of the abyss.” But trying to estimate when our particular clusters of galaxies began is most likely impossible to determine. I touched on this in “the long voyage” part of “the picnic at the edge of the universe” suggesting that others night exist, but it really was just a poetical fancy, not a prediction. But it’s fun to imagine it in a logical way. I remember seeing a time lapse movie of frost forming, expanding and then dissolving on the inside of a window pane. It’s a 2D analog of the concept except in the case of the universe the field itself -not some other medium- is generating the “frost” formation. In addressing the matter of fields, we should ask first what is it that a field does? A short answer is that it describes the extension of some property in time and space. Mass, energy, EM charge. Time and space are pretty much axiomatic, though we can express time as the contrasting of two different spatial changes or displacements. Velocity, therefore, is a fundamental field parameter, along with acceleration and jerk. The addition, or product really, of these parameters and mass converts the kinematics of a field to its dynamic properties, momentum, force, and yank. But what is mass but an inverse measure of displacement, the inertia or resistance to change in position of some element of a field in response to an impulse from some other element. And what is an impulse but a change in momentum over time, i.e. a force. Action, the product of the change in momentum of some element and the distance over which the change occurs. Energy, the measure of activity or rate of action per unit of time. Charge appears to be a qualitatively different property, but a close look shows it to be a potential momentum in its static mode or a rate of momentum change over time, another force, in its dynamic mode as current. Fundamental quantizations, then differ in their dynamic intensities. The point is that regardless of the quantization mode or particle, as found extended in space and time and denominated as an excitation mode of a disparate field, any dynamic measure of a field is a measure of its inertial change and therefore all dynamic quantizations express the properties of a single inertial field. The key is not in finding how disparate dynamic fields interact, but instead how different excitations or quantizations are dynamic expressions of a single inertial field. Since wave mechanics produces quantizations of an inertial, i.e. stress field, and matter quanta exhibits some of the features of waves, this suggests the examination of cosmic spacetime as a unifying inertial wave bearing field. No need for singularities. And as quantum energy is expressed as a frequency, mass is simply its conjugate, quantum wave number, necessarily conjugated by the wave velocity. Find the fundamental excitation of the field, it’s characteristic frequency, and all the rest will fall into place. (published in Foundations of Physics, vol. 39, nr. 1, p. 73 (2009)). I wish that my familiarity with the formal symbolic logic and lexicon of QFT allowed a ready reading of your paper, so I could get a feel of its geometric structures and constraints. Though I believe I have a reasonably decent conceptual understanding, my own experience is confined to the mathematical formalism of classical wave mechanics, albeit in terms of stress and strain tensors of a three dimensional continuum. Referring to the Wikipedia article on Fermions, there is a graphic at the start of the article of an antisymmetric wave function of a fermionic 2 particle state showing two alternating peaks and troughs as a statistical interpretation, I assume. In my graphic interpretation of a neutron, there is only one peak opposite one trough, as if one half of a grapefruit, adhered to the underside of the planar membrane of the above graphic, was rotated one half Pi about a diameter across the open face of the fruit. Rotating the fruit counter clockwise when viewed from above about a vertical axis so that the membrane slips over it while it rotates, oscillating transversely while the phases rotate about the vertical axis, produces spin. Classical analysis shows that the moment of inertia of the configuration is similar to that of a hoop rotating about its diameter or ½ that of a hoop rotating about its center of mass. Hence if the peak/trough configuration is seen as a femtoscale strain in an inertial continuum or ether with an extremely high bulk modulus, rotating at the yoctohertz frequency, we have a classical foundational model of a ½ spin quantum particle. The Wikipedia article on Spin has an animated graphic designed to show the coordinate entanglement condition, but the vertical green axis, while perhaps statistically relevant, has been over rotated if it is intended to represent the physical condition of spin. If this axis was rotated only one half Pi instead of Pi, the coordinates would complete their oscillation in one cycle instead of two. More to the point, as shown, if this was to represent a physical action in a continuum, the green axis would become indefinitely twisted, while the other two coordinates would fail to exhibit the torque that a dynamic continuum would exhibit. The grapefruit analogy avoids the twisting and allows for the torque. With beta decay, this configuration advances about the vertical axis and emits wave energy as an electron, thereby lowering its own frequency to that of the proton. Quarks of the SM are the nodes / antinodes of this arrangement, which is obviously non-commutative. Interestingly, the antisymmetric components produce spin, while the differential symmetric ones produce quantum gravity. Analysis of the dynamics of this arrangement can be found in various YouTube videos at the channel under my name, where it is also described as an extreme Kerr metric for a quantum “black hole”. (In my view a black hole is a locus of maximum inertial density and does not precipitate a singularity.) Such rotational oscillation acts as the mechanical analogy of a tiny LC current, where charge is maximized at the peak and trough extremes and current is maximized at the level of the surrounding plane. The Lagrangian of this contraption is invariant, by the way.